When it comes to natural materials to use in your garden, beautiful, well-treated wood is hard to beat. Whether it’s the inclusion of fruit and ornamental trees or wooden furniture in an outdoor space, this material really adds to the aesthetic of a traditional garden. It can give an organic feel to even the most modern of plots and has been used throughout history for everything from the humble shed to hand-crafted verandas. Despite the attractive qualities of the material, in a wet, cold or simply British climate any wood product can suffer a real battering. Rather than keeping its golden hue or subtly-textured surface, rain, snow, wind, fungus and even just dirt can have a disastrous effect on the colour and feel of wood products. One common problem is discolouration, where the wood colour either fades from exposure to UV rays, or blackens. Blackening is very common in damp climates, and tends to occur after lengthy, wet winters; it’s caused by fungus clinging to the wood. Without the right treatment, wood products can also become slippery or warped, which is especially dangerous for decking or pathways. 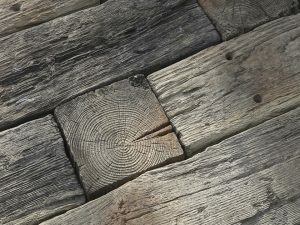 Eventually, even the best wood products will start to rot, and often this occurs internally in the wood long before it’s visible on the outside. 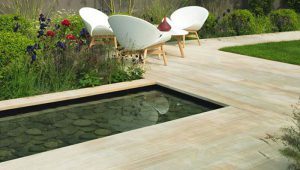 The visual and tactile qualities of a wood product can really bring a garden design to life – but with all these maintenance issues to deal with, it’s often more hassle than it’s worth. One solution is to use a more hard-wearing product that looks (and feels) like wood but doesn’t have the same problems when it comes to wear and tear. A contemporary solution is stone moulded and treated to look just like timber. Although heavier than natural wood, there are plenty of benefits to using this more durable alternative. First, stone isn’t subject to the same discolouration or blackening as wood itself, meaning it keeps its colour for longer, which means your garden will look better for longer, too! Stone won’t warp or rot either, so it’s much safer for paving and pathways. While stone, if left uncared for, can become home to moss or lichen, it’s a lot easier to clean than wood and there’s no chance of fungus getting into its ‘bones’ to cause problems from the inside out. Because it’s more durable, wood-like stone can also hold greater weight, making it a better option for raised beds where planting needs to be kept securely in place or paths which will get a lot of use. And because it’s moulded from timber (so it has that beautiful grain), the edges are crisper and easier to fit together, so you’re less likely to have gaps where weeds or moulds can creep in. Wood-like stone products can be used in exactly the same way as traditional wood products when designing your garden. They’re shaped to look as similar to the original timber as possible, so you can use them wherever you would have normally put the original material. Here are just a few design ideas using some of our wood-like stone products. Using Timberstone stepping stones, lay a natural pathway through a wild garden, either sunk into turf or surrounded by another natural material like chippings or gravel. These stepping stones are more durable, warp-resistant and less prone to slipperiness than traditional log slices. 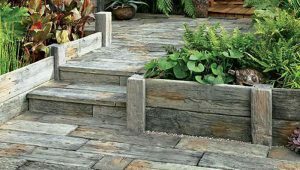 Build a raised deck with our Timberstone sleepers, using the two different sizes to give a real feeling of traditional wood. The Driftwood colourway looks particularly good in modern spaces. Make the most of space in a steep garden by building stepped planters of varying heights using the Timberstone posts and sleepers. Their added strength means planters will support larger shrubs and vegetables without fear of any movement. For an organic look without the problems that natural wood products bring, timber-like stone could be the ideal solution. 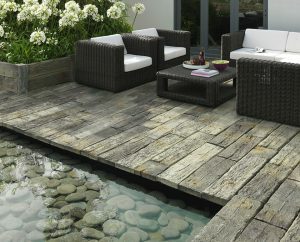 To find out whether it’s right for your garden, explore more of our Timberstone products here.